Social Media – Brain Plasticity (BPL) is now on Twitter (@BPL_Journal), with our new social media editor Dr. Jibran Khokar at the helm. Be sure to follow us and be part of the conversation! Latest Content – View all the open access articles here, including the latest special issue (Vol.4, Iss.1) covering the topic: Lifestyle Factors and Neurodegenerative Diseases. Newsletter – Be sure to sign up to the BPL newsletter to receive alerts of new issues and other journal news. Sign up via this link tiny.cc/BPLsignup & you can read the latest newsletter here. Open Access Fee Waiver – BPL is an open access journal and we are pleased to announce that the open access fees are waived for papers submitted 2019! 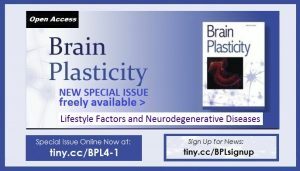 Brain Plasticity publishes peer-reviewed Original Articles, Reviews and Short Communications on all aspects of neurogenesis, gliogenesis and synaptic plasticity, from development to the adult. This includes research articles or reviews on modifications to neural circuits in the developing and adult brain, whether by learning or physical activity, spine formation, changes in neural structure, changes in neural networks, new cell division, as well as response of the CNS to experimental injuries, neurodevelopmental and neurodegenerative disorders. Papers adopting fresh conceptual approaches on specification and function at the molecular and cellular levels, neural circuits, systems and behavioral levels are encouraged. Journal papers will be published Open Access (OA). The article will be freely available from the moment it is published, also in the pre-press module. For the first years of publication, no article processing charges are required. See our website for more information about our policy: IOS Press Open Library®. This journal operates with single-blind peer review. If the author prefers double-blind peer review, then please submit your manuscript excluding the author listing and make sure your document is anonymized, and list the authors and affiliations only in the cover letter for the Editor. Submission of an article is understood to imply that the article is original and unpublished and is not being considered for publication elsewhere. Any possible conflict of interest, financial or otherwise, related to the submitted work must be clearly indicated in the manuscript. By submitting the paper the author agrees to the Author Copyright Agreement. Procedures involving experiments on human subjects should be in accord with the ethical standards of the Committee on Human Experimentation of the institution in which the experiments were done or in accord with the Helsinki Declaration of 1975. Procedures involving experimentation on animal subjects should be in accord with either the guide of the institution in which the experiments were done, or with the National Research Council’s guide for the care and use of laboratory animals. The author must state compliance in the cover letter and in the Methods section of the article. Preferably patients in figures should be unrecognizable. Authors are responsible for obtaining patient permission for use of the material from all recognizable participants in photographs, videos, or other information that may be published in the Journal or on the journal’s website. A statement that permission was granted by the patient must accompany the figure legend. Do not use study participants' names, initials, or hospital numbers anywhere in the manuscript (including figures). Leave the author information blank if double-blind peer review is wished for, but do include the information in the cover letter. When submitting the manuscript the author listing and order should be final. If any addition, deletion or rearrangement of author names in the authorship list does need to be made after submission, this can be done only before acceptance and with the Editor’s approval. To request such a change, the Editor must receive the following from the corresponding author: (1) the reason for the change in author list and (2) written confirmation from all authors, including the affected author, that they agree with the addition, removal or rearrangement. Only in exceptional circumstances will the Editor consider the addition, deletion or rearrangement of authors after the manuscript has been accepted. While the Editor considers the request, publication of the manuscript will be suspended. If the manuscript has already been published in an issue, any requests approved by the Editor will result in an Erratum. For other papers such as Reviews or Protocols, the abstract should be clear, descriptive, and self-explanatory, and no longer than 250 words. Authors are requested to use the Vancouver citation style. Place citations as numbers in square brackets in the text. All publications cited in the text should be presented in a list of references at the end of the manuscript. List the references in the order in which they appear in the text. Only articles published or accepted for publication should be listed in the reference list. Submitted articles can be listed as (author(s), unpublished data). If an article has a DOI, this should be provided after the page number details. The number is added after the letters 'doi'. Manuscripts will not be considered if they do not conform to the Vancouver citation guidelines. Number according to their sequence in the text. The text should include references to all tables. - Provide each table on a separate page of the manuscript after the references. - Include a brief and self-explanatory title with any explanations essential to the understanding of the table given in footnotes at the bottom of the table. - Vertical lines should not be used to separate columns. Leave some extra space between the columns instead. Figures should be designed with the format of JHD in mind and preferable sized as they will appear when printed. A single column of the journal is 77mm and two columns are 165mm. Supplementary data can be submitted with the manuscript, included within the manuscript after the Figures and Tables (or otherwise after the References). Each supplementary item should have a legend and should not exceed the file size of 10MB. Supplemental videos can be submitted separately (see top of page for submission guidelines of videos). A short description of the supplementary items should be included under the header of “Supplementary Material” within the manuscript before the “References”. Supplementary material will be made available in the format in which it was provided. Large datasets should be hosted on the author’s own or institute’s website or in an appropriate database, and should be properly cited within the manuscript. Book reviews should be 750 words or less and without sections. Suggestions can be proposed to the Co-Editors. Authors can submit Letters of 1000 words or less concerning prior articles published in Brain Plasticity to the Co-Editors through the Editorial Office. Name of an Co-Editor with expertise in the area of the study (if no Co-Editor is suitable, the Editorial Office will handle the submission). All affiliations with or financial involvement (e.g., employment, consultancies, honoraria, stock ownership or options, expert testimony, grants or patents received or pending, royalties) with any organization or entity with a financial interest in or in financial competition with the subject matter or materials discussed in the manuscript are completely disclosed in the letter of submission. All financial and material support for this research and work are clearly identified in the manuscript including listing of support specified in the letter of submission that might constitute or give the appearance of influencing the findings, based on the judgment of the Editor-in-Chief in consultation with the Associate Editor handling the review of the manuscript. Accepted articles will be placed online as "pre-press" articles two weeks after acceptance. The corresponding author will receive the PDF proof around the same time, and is asked to check this proof carefully (the publisher will execute a cursory check only). Corrections other than printer's errors should be avoided. Costs arising from excessive corrections will be charged to the authors. The pre-press file will remain as the uncorrected proof version until the article is published in an issue and the final published version replaces the pre-press file. Brain Plasticity is a full Open Access journal, which helps authors to comply with major funder mandates. Because Brain Plasticity is a newly-launched journal it is currently not yet able to deposit articles directly into Pubmed Central for the author, and the author must do this themselves. IOS Press grants authors permission to freely deposit the published PDF to PubMed Central and affiliated repositories after final publication in an issue with no embargo period. The guidelines for PubMed Central submission can be found here (follow Submission Method C). As soon as Brain Plasticity has passed the Pubmed Central application review, IOS Press will be able to deposit the articles for the authors directly on publication, and these instructions will be updated accordingly. Of course it is a priority to the Editors and Publisher to have this journal listed into Pubmed Central as soon as possible to optimize our service to our authors. If requested by the author, Research Councils UK (RCUK) and Wellcome Trust funded Open Access articles will be published under the terms of the Creative Commons Attribution License (CC-BY). After acceptance of their article, the author should send a separate message to the publisher at r.holst@iospress.nl to notify that their article (include reference number) should be published Open Access under the RCUK mandate. An extra fee applies for CC-BY publications. Here also the author must make the deposit to Pubmed Central themselves using Submission Method C until Brain Plasticity has been accepted by Pubmed Central. 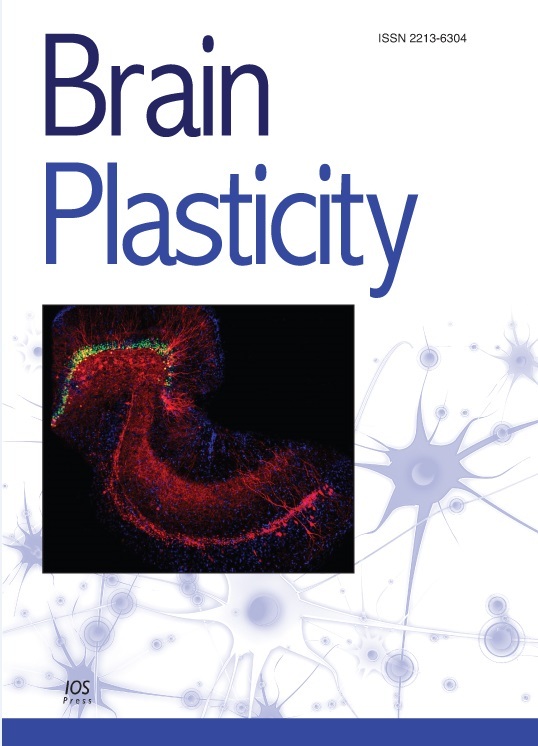 Permissions for use of materials published in Brain Plasticity (figures, tables, thesis publication) can be requested at publisher@iospress.nl. An order form for reprints and additional journal copies will be provided along with the pdf proof. If you wish to order reprints of an earlier published article, please contact the publisher for a quotation. IOS Press, Fax: +31 20 6870039. Email: editorial@iospress.nl. 12 Jun 2017 - Amsterdam, NL – In a new review of the effects of acute exercise published in Brain Plasticity, researchers not only summarize the behavioral and cognitive effects of a single bout of exercise, but also summarize data from a large number of neurophysiological and neurochemical studies in both humans and animals showing the wide range of brain changes that result from a single session of physical exercise (i.e., acute exercise). Can Physical Exercise Enhance Long-Term Memory?